Our compassionate team members strive to create a relaxing atmosphere where every patient feels comfortable. 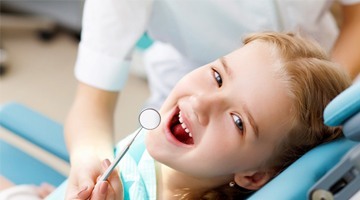 We especially want to give our younger patients positive dental experiences that start a lifetime of good oral health. Recognizing the trust it takes to put your child’s care in her hands and as a mother, Dr. Guthrie is gentle and friendly and enjoys educating her young patients about caring for their smiles. After your baby turns one year old, you should start bringing them in for dental checkups every six months. This first visit will likely consist mostly of helping your child get used to Dr. Guthrie, our staff, and the dental tools. 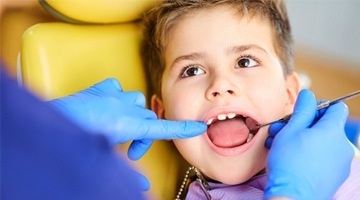 We will also conduct a gentle examination of your child’s teeth and gums to ensure that they are developing well. 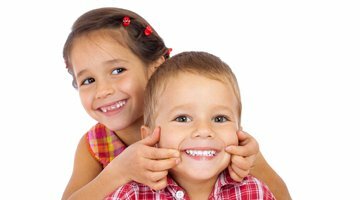 If you have any questions about caring for your child’s growing smile, we will gladly address them, providing you with the knowledge and tools you need to make oral care fun and efficient for your child. It’s never too early to start protecting your child’s adorable smile. Even before their teeth grow in, you can use a washcloth to wipe away bacteria after feedings. As soon as you see their baby teeth come in, you can begin gently brushing their teeth twice a day. When they get more of their back teeth, you may need to add flossing to their daily routine to help prevent cavities. Combined with your child’s semiannual dental checkups, these important habits can set your child on the road to dental health for the future. Other than brushing and flossing, one of the best things you can do to protect their teeth is get a fluoride treatment for your child at their next checkup and cleaning. According to the Center of Disease Control and Prevention, this fluoride varnish alone can prevent about 33 percent of cavities in baby teeth. It’s a quick, painless way to help strengthen your child’s pearly whites against cavity-causing bacteria. For an additional line of defense against plaque and bacteria, you may want to consider getting dental sealants for your child when their premolars and molars start coming in. This thin protective coating is applied to the chewing surfaces of their back teeth, where many cavities occur for children, and acts like a shield against plaque. In fact, dental sealants have been found to reduce the risk of cavities in molars by 80 percent! Even with diligent oral hygiene at home and regular dental checkups and cleanings, your child may still get a cavity or two. No problem! We understand. To restore either their baby or permanent teeth, we use a safe composite resin filling material that is shaded to match their tooth color and molded to look like natural tooth structure. We’ll work so they can get back to playing, laughing, learning, and smiling with confidence in no time! We love seeing our patients smile and do everything we can to make sure they can keep their happy, healthy smiles for many years to come. Contact us today for an appointment!